featuring our quick and delicious Express Lunch Buffet for only $9.95! small groups, etc. by arrangement; call Eric at (608) 325-3461 for more information. 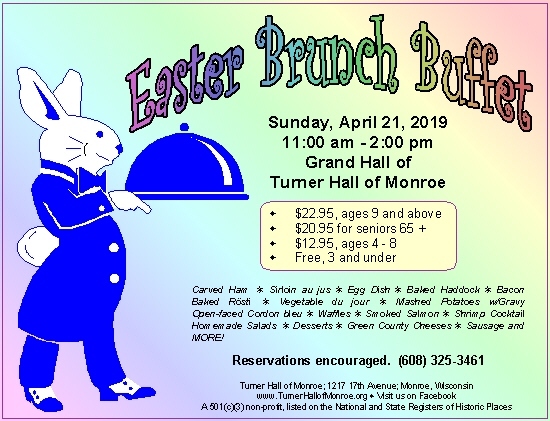 Please phone (608) 325-3461 for any general reservations. email, Facebook, or any other online means at this this time. Thank-you! Read a recent review about Turner Hall's Ratskeller in the Janesville Gazette. or trendy items here, just good quality entrées, freshly prepared, at a reasonable price.